The very nature of a garden is that it is ever evolving, every changing, and ever growing. In many ways, this is great, as it means that your garden will, over time, grow into its features and hopefully become one of those longed-for mature gardens that we’d all like to be the proud owners of. However, if a garden isn’t assessed regularly, it can easily become overgrown and / or in need of repair. That’s why it’s crucial to regularly carry out a stocktake of your garden to see if anything needs repairing or keeping in check. By doing this regularly, you’ll avoid expensive renovations further down the line. The first assessment of the year really needs to be done before your plants spring back into life and start growing in earnest. With foliage at a minimum at this time of year, check all of your hard landscaping, including the likes of gazebos, patios and fencing. 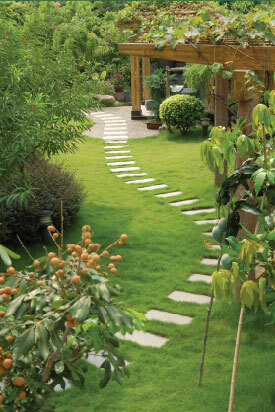 If there are any signs of wear and tear to your hard landscaping features, speak to a specialist garden design company. If possible, book them in to carry out repairs now, so that your garden is ready to enjoy during the summer months ahead. If you’re not sure that a problem is serious enough to warrant repair at this stage, take notes and photograph the issue so that you can revisit it in a few months’ time to see whether it’s become any worse. During the summer months, your focus should be on your planting plan. With foliage at its full height, you can clearly see where there are any gaps in your planting, or where areas have become overcrowded. Assess whether you need to space your plants a little better, and consult a professional gardener so as to ensure that only those plants which are resilient to being moved are moved. It’s also worth speaking to a professional garden landscaper at this point to see what plants you should purchase to fill the gaps, in order to choose plants which work best within your garden conditions. Autumn is the time to prepare for the harsh winter months ahead. Once again, check all of your hard landscaping, and carry out any necessary repairs, before the cold weather and damp conditions take hold and potentially make any issues worse. Clear any debris at this time of year, and it’s also worth assessing whether you need any trees felled or corrective pruning. If you’re not sure, speak to a professional garden landscape company for their advice. It may seem that there is always work to be done in the garden, but an area of beauty is not achieved overnight and then left to its own devices, unfortunately. With a little thoughtful consideration and the advice of a garden landscaper, your garden maintenance can be made much easier. D&G Garden World will happily take stock of gardens in Upminster, Brentwood, Orsett and Hornchurch, taking away the hard work for you.